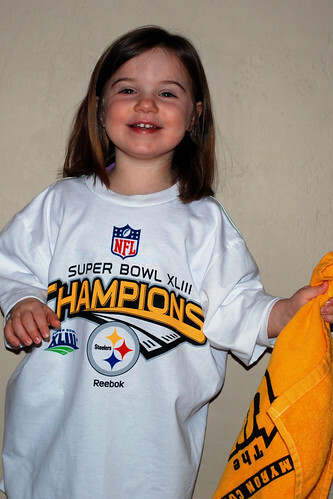 sinkerbeam: kidstuff: Super Bowl Champions! It may be number six for the franchise, but it's only number one for Evy. Hopefully she'll get to see many more (and be able to watch past halftime). Go Steelers! I love the T-shirt. You can wear it for a very long time. I was wondering if the towel was the same one you have had, or one that was made to celebrate the victory. Mr. Cope would be very proud of you. Wave that terrible towel! Daddy should have taken it to the parade today. Maybe he could have had some players autograph it! Grandma C.